Jurickson Profar entered the 2013 as the game's top prospect according to Baseball America. Signed as a free agent by the Texas Rangers in 2009, the infielder made his MLB debut as a call-up at the end of the 2012 season. 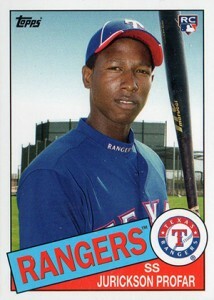 At the time, Profar was still a teenager. He had quite the debut, smacking a home run in his first big league at-bat. After starting the 2013 season in the minors, it took less than two months for the infielder to make his return to the Rangers. Shop for Jurickson Profar cards on eBay. Profar is seen by many as a five-tool standout who can hit for power and average. The switch-hitter also has tremendous speed and is a defensive standout. If things pan out, he's going to be a superstar. Being so young, time is on Profar's side. It may take him a couple of years to find his way in the majors. But the long-term outlook is strong. 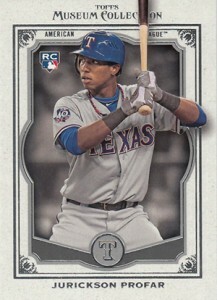 From a collecting standpoint, Jurickson Profar rookie cards can be found in 2013 products. He has cards in several earlier sets, though. 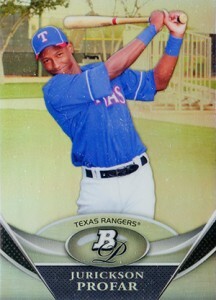 Profar's first major cards can be found in 2010 Donruss Elite Extra Edition. He's also in a couple of 2011 Bowman products, which are seen as some of his most important cards. But, because they're inserts, they're not official rookie cards. Jurickson Profar rookie cards will be released throughout the 2013 season. We'll provide updates as new sets are released. 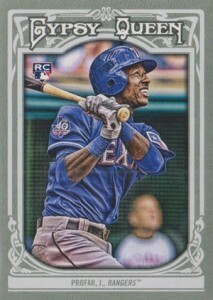 Clean white borders, clear action shot -- the 2013 Bowman Jurickson Profar rookie card is an attractive card. It's also extremely affordable as most collectors overlook the base cards and focus on the prospects. Like Bowman, this is another clean-looking card that's inexpensive and readily available. It's unlikely it'll ever be worth much monetarily. 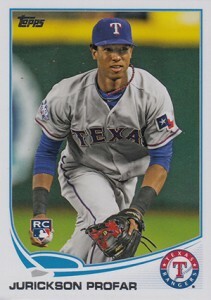 But coming from the main Topps set, it's one that will be seen lots over time if Profar becomes the superstar like many expect. Inspired by the look of 1985 Topps Baseball, this card provides more old-school nostalgia than long-term value prospects. Like other low-end cards, it should never carry a huge price tag. Profar is also included in several insert sets, including the tough Retail Chase set. The look of this card is a little more extreme. It has an old-time feel mixed with some heavy Photoshop. Traditionally, Gypsy Queen base cards carry a slight premium over its low-end counterparts like base Topps, but not by much. 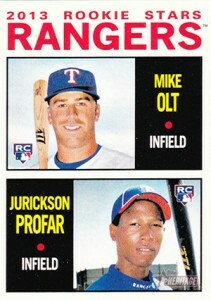 Profar shares his 2013 Topps Heritage rookie card with Mike Olt, another solid prospect in the Rangers system. Topps Heritage is very popular with set builders. However, this card's long-term outlook is largely dependent on how well both perform. Although not numbered, the 2013 Topps Museum Collection Jurickson Profar is a slightly more high-end option than a lot of his other basic rookie cards. It has elegant lines, a nice photo and sturdy card stock. With only a dozen base cards in every high-end box, it's also somewhat tough to pull. This looks a whole lot like Profar's basic Topps rookie card. Really close. The main difference on the front is the Opening Day logo. Like Topps, the card is cheap and readily available. Topps Opening Day has never been about pricey cards. No matter what Profar achieves, it's likely it'll ever be worth more than a few dollars. 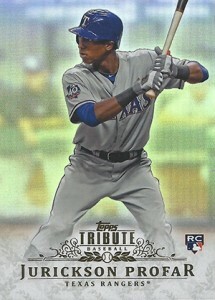 The 2013 Topps Tribute Jurickson Profar is his first high-end rookie card. Rather, it's his first from a premium set. Base cards aren't numbered, nor do they have any other major selling points that would make them expensive. However, it is an extremely attractive card for those who like the foil look. For those on a budget but not interested in low-end cards, this is an excellent option. Although not a licensed set, 2010 Donruss Elite Extra Edition is the first major set to feature Jurickson Profar. He has a base card in the set, but it's his autograph that draws the most interest. Not only did the set beat 2011 Bowman Chrome to the market, but it's also numbered. On the downside, besides not being licensed, the autograph is also on a sticker. In the end, it's a solid alternative to the 2011 Bowman Chrome autograph that will save you a little money. 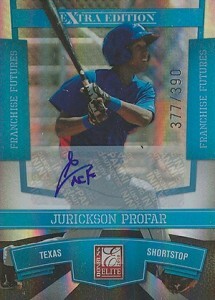 Not everyone can afford the 2011 Bowman Chrome Jurickson Profar autograph. However, the basic version of the card is attainable at all budgets. The numerous Refractors add a level of chase. So it doesn't have the rookie card label. 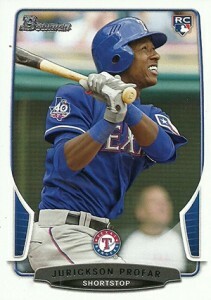 It's still the most popular Jurickson Profar card and will remain as such. 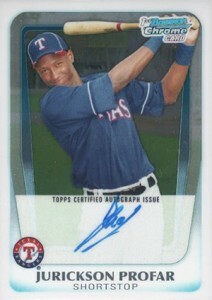 The first set to include Profar in a Rangers uniform, the card is signed on-card. It also carries the Bowman Chrome pedigree that is important with many collectors. Part of the Prospects insert set, it's not a rookie but it's still viewed by many as such. Bowman Platinum isn't as popular as Bowman Chrome, but it's another affordable prospect card that predates his official rookie cards. It's unfortunate that it uses the same photo as his other 2011 Bowman cards, but the Refractor finish gives it more color.